People are generally not accustomed to the idea of a central bank altering the maturity structure of outstanding government debt in a manner that might confer a financial benefit to the government (and by extension, to the citizens it represents). The purpose of my previous post was to make people aware of this possibility, using the recent experience of the Federal Reserve's quantitative easing (QE) program as an example. The gist of my story went something like this. Suppose that the Fed makes a one-time purchase of a 10-year treasury bond yielding a risk-free 2.5% annual nominal coupon. Suppose that the purchase is financed by "printing" reserves. (Note, this asset purchase and method of finance describes the basic nature of QE). Suppose further that the interest paid on reserves remains below 2.5% for the duration of the bond. Then the Fed makes a profit off the rate of return differential in each of the 10 years it holds the bond on its books. If I understand my critics correctly, none would dispute the financial benefit associated with this Fed intervention as far as the public purse is concerned; at least, as long as it is somehow known ex ante that the short rate will remain below the long rate in the manner assumed. One objection to this story asks why the Fed is needed to convert a 10-year bond into a lower-cost short-term instrument when the Treasury itself could have just issued a short-term debt instrument to begin with. That's a good question. I'm not sure what factors determine the Treasury's choice over the maturity structure of its debt. The key question to ask is whether the structure chosen is optimal from a social standpoint. The benefit associated with the Fed intervention I described in my post assumes that it is not. What justifies this assumption? No one really challenged me on this. Another objection relates to the optics of the enterprise from a political perspective. 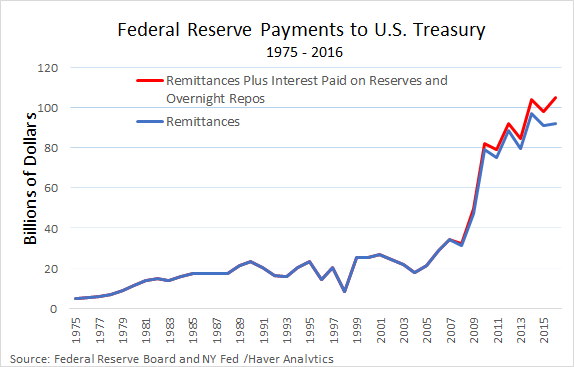 Even if the intervention makes sense from an economic perspective, paying interest on reserves held by big banks with the effect of reducing Fed remittances to the Treasury just looks bad (even though it's equivalent to the Treasury paying those big banks for holding treasury debt). When the Fed borrows short from the banks to lend long to the Treasury, it does not do so costlessly. Duration transformation carries a risk of capital loss, also known as duration risk. Suppose the yield curve shifts up, both short and long interest rates rising together. The Fed will experience a decline in present value of its assets that will swamp the smaller decline in the present value of its liabilities. Such an event is not unknown: in 1979-81 it rendered insolvent about two-thirds of US thrift institutions, who were financing 30-year fixed-rate mortgages with 1- and 2-year deposits. In cash-flow terms, such an event would mean that the Fed would quickly have to start paying higher interest rates to borrow, while its asset portfolio continues to pay low yields and roll over much more slowly. The Fed’s annual net transfer to the Treasury might even go negative. 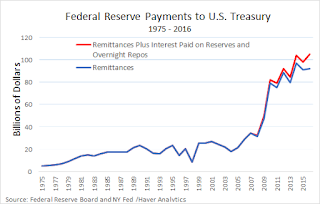 Smaller or negative transfers from the Fed to the Treasury would mean a sudden jump in the present value of the public’s ordinary tax liabilities. Net interest income from playing the yield curve is not a free lunch. To assess the merit of this critique, let's consider the following thought experiment. First, imagine that there is no central bank (End the Fed wins). Next, imagine that the Treasury wants to borrow money. One option is to issue the 2.5% 10-year bond described above. But another option would be to issue very short-term treasury debt, rolling it over for 10 years. If the Treasury behaved in this manner, it would in effect be replicating the Fed intervention I described above. There would be obvious cost savings to the government and taxpayer, at least, assuming that short rates remained below 2.5%. So what could possibly go wrong? Well, the risk is that the short-term rate might rise and stay on average over 2.5% for the next 10 years. In that event, which is certainly a risk to consider, the Treasury will have made a loss relative to locking in its debt at the long-term rate of 2.5%. But from the perspective of the taxpayer, it matters not one iota whether this prospective loss is incurred because of the Treasury action or an equivalent action on the part of a Fed QE program. So, if the point is that financing short-term at low rates entails risk relative to financing long-term at high rates, then I agree. The question, however, is not whether QE exposes the taxpayer to duration risk. Of course it does. The same would be true if the Treasury was to shorten the average duration of its debt on its own. Whether the Fed or Treasury performs this operation is immaterial (from an economic perspective, not necessarily from a political perspective). The fundamental question then is whether government debt is structured optimally to begin with. To the extent that the fiscal authority relies too heavily on long-term debt, then some QE on the part of the Fed could have the public finance benefit I described in my post. Does the Treasury rely too heavily on long-term debt? I honestly do not know. Those who warn against the Fed shortening duration must implicitly assume that Treasury debt-structure is optimal. Maybe they're right. But as the following figure shows, the spread between long and short rates is usually (though not always) positive. If this pattern could be relied on to hold in the future, then the question to ask of a QE program is not whether it entails duration risk (it does). Rather, the question is whether the endeavor constitutes a positive net-present-value project. The data above suggests that it may very well be. This is not the same as claiming there's a "free lunch." The Fed has saved the government over $80 billion a year over the past seven years. That's about $600 billion in cost savings--money that the government would have had to secure through other means to service its debt. It was fluke, the critics will say. An ex ante gamble that pays off ex post is not a justification. Sure. But billions in remittances, year after year, one fluke after another? Let me briefly address a few other points made by Larry. In the quoted passage above, he warns that the Fed is exposed to suffering a capital loss on its assets should market interest rates rise, that this has happened to private banks in the past with dire consequences, that the result may be lower (possibly negative) remittances to the Treasury. I think these concerns are overstated. Warning against the prospect of having to reduce remittances is not an economic argument against exploiting a profit opportunity (although, one could make the case on political grounds). Yes, if the market price of bonds fell, the market value of Fed assets would decline. Should this be a concern? U.S. treasury bonds are nominally risk-free and the Fed normally holds its assets to maturity. Larry's reference to the plight of U.S. thrift institutions is not, in my view, relevant to the issue at hand. Because Fed liabilities are money (essentially equity shares accepted by all as a payment instrument), the Fed cannot go insolvent in the same way a private company can (although politically, the optics would be bad). In any case, the proper way to view the issue is from the perspective of a consolidated Fed/Treasury balance sheet. The issue concerns optimal maturity structure and the impact on the government's consolidated balance sheet as market interest rates change. It is also Larry's view that the Fed has been carrying "significant" default risk through its holdings of mortgage-backed securities. While I think there are good reasons to let the MBS portion of the Fed's balance sheet run off, I think Larry is once again overstating concerns (even if I grant his point about potential market distortions). The MBS purchased by the Fed are not legacy assets--they constitute senior tranches of securities issued well after the real estate market bottomed out. In short, they're about as safe as securities backed by private assets get. That's not to say that the Fed should be holding such assets. My own view is that the Treasury should have issued bonds against such securities. Doing so would have gone some way to alleviating the worldwide shortage of safe assets. Larry concludes with a plea for "normalization." Let's go back to a world where bank reserves are scarce. But why? In what world does it make sense to render liquidity scarce? Milton Friedman argued that optimal debt policy entails eliminating all liquidity premia. Almost every economic model I am aware of supports this notion. An appeal to follow historical norms is not an economic argument. Let me sum up. I think there are two types of arguments one can bring to bear on the question of central bank balance sheet policy as a fiscal debt-management device. The first is economic and the second is political. The political argument is based on the idea that an independent and accountable central bank is a good idea. To protect central bank independence, it would be unwise for a central bank to operate with the expressed purpose of managing the debt--a realm guarded jealously by the fiscal authority. I think this is a good and practical argument against becoming too enthused with large central bank balance sheets. But this is not the argument that Larry is making. Larry's argument is an economic one. An economic argument against the Fed helping to manage the debt, suggested to me by my colleague Steve Williamson, is that the Fed does not really have the tools to do the job properly. In particular, the Fed cannot issue debt that can circulate widely. The only liability it can issue--reserves--is clearly inferior to short-term treasury debt. In particular, reserves can only be used by banks with reserve accounts, while treasuries can circulate outside the banking system. This is a good point. It basically says "since the Treasury can do the job better in principle, better the Fed not do it at all." But this not the argument Larry is making either. As I reflect back on the original argument I put forth, I think I would now put it in the following way. First, I would not advocate that the Fed explicitly pursue balance sheet policy as a way to help government financing. As I made clear in my original post, the recommendations I was making were predicated on the assumption of the Fed achieving its dual mandate. If in the course of achieving the dual mandate the Fed is saving the Treasury billions of dollars, then what's the rush to reverse operations? The fear of exposing the taxpayer to duration risk may be a reason--if you feel the Treasury already has its debt structured optimally. But the fact of consistently positive and sometimes very large remittances from Fed to Treasury for years (and even decades) might lead one to question that assumption.